Suresh N. Hakkandi Professor & HOD, Dept. of Panchakarma, Shree Jagdguru Gavisiddeshwara Ayurvedic Medical College, Koppal, Karnataka, INDIA. Manjunath Akki Akki Professor, Dept. of Panchakarma, Shree Jagdguru Gavisiddeshwara Ayurvedic Medical College, Koppal, Karnataka, INDIA. Bhavana K S Post Graduate Scholar, Dept. of Panchakarma, Shree Jagdguru Gavisiddeshwara Ayurvedic Medical College, Koppal, Karnataka, INDIA. Vata Vyadhi is one of the most prevailing health problems in our day today clinical practice, Gridhrasi is one among them. Gridhrasi is Shoola Pradhana Nanatmaja Vatavyadhi, affecting the locomotor system and disable from daily routine activity. Gridhrasi the name itself indicates the way of gait shown by the patient due to extreme pain i.e. like Gridhra or Vulture. Gridhrasi is a condition characterized by Ruk, Toda, Stambha, Spandana in Sphik Pradesha and radiates downwards to Kati, Prusta, Uru, Janu, Jangha and Pada. Gridhrasi can be compared with Sciatica. Pain is the chief cause of person to visit a doctor. Although low back pain is a common condition that affects as many as 80 to 90 percent of people during their lifetime. Gridhrasi can be cured by the help of Vaitarana Basti. Hence in the case study of male patient of age 30 yrs presenting with cardinal clinical sign and symptoms of Gridhrasi are Ruka, Toda and Muhu Spandana in the Sphika, Kati, Uru, Janu, Jangha and Pada in order and Sakthikshepanigraha that is restricted lifting of the leg. HAKKANDI, Suresh N.; AKKI, Manjunath Akki; S, Bhavana K. ROLE OF VAITARANA BASTI IN THE MANAGEMENT OF GRIDHRASI W.S.R. TO SCIATICA. 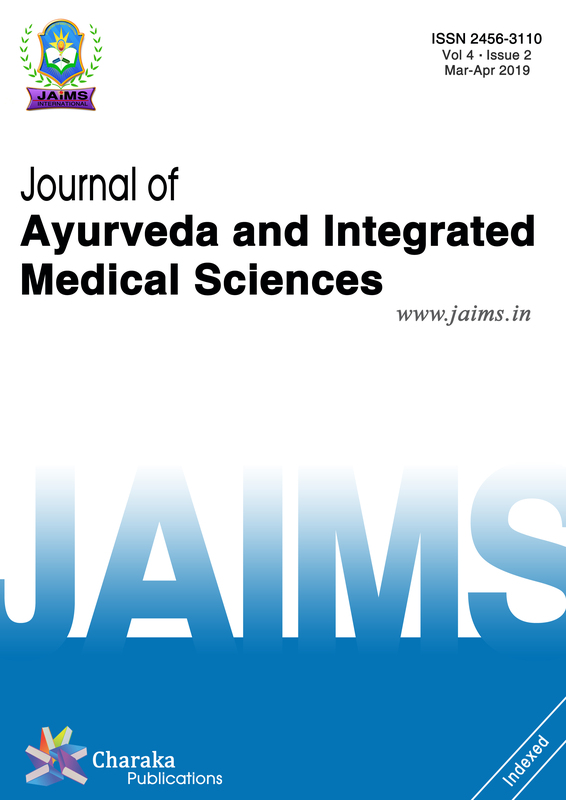 Journal of Ayurveda and Integrated Medical Sciences (ISSN 2456-3110), http://www.jaims.in/index.php/jaims/pages/view/Citation, v. 3, n. 5, p. 244 - 247, nov. 2018. ISSN 2456-3110. Available at: <https://jaims.in/index.php/jaims/article/view/711>. Date accessed: 25 apr. 2019. doi: https://doi.org/10.21760/jaims.v3i5.13853.